If the Wolves are looking for a model for how you can play fast and still play the strong defense that coach Tom Thibodeau craves, they will get a close look at it in China. When Tom Thibodeau arrived in Minnesota last season, he brought with him a reputation for defensive acumen. His Bulls teams routinely ranked high in key defensive categories. Offensively? Well, even when Derrick Rose was healthy and playing at an MVP level, they were generally methodical and not in any particular hurry to score. The Bulls were more likely to grind out a low-scoring victory than run their way to a high-scoring win. In terms of offensive pace — the number of possessions a team uses per game — Thibodeau’s Bulls never ranked higher than 20th in the NBA in his five seasons in Chicago. In his first season in Minnesota, with several young Wolves players perhaps suited to playing faster, Thibodeau’s squad last season finished tied for 22nd in that category. So it was interesting to see the Timberwolves’ preseason debut over the weekend. One thing that struck beat writer Jerry Zgoda — which we talked about on this week’s Timberwolves Talk podcast — was the speed at which Minnesota played, particularly when its starters were on the court together in the first quarter. 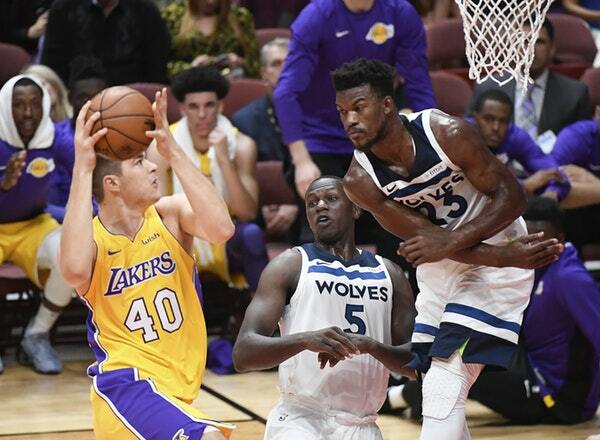 The Wolves and Lakers finished the first quarter tied 31-31. For the game, Minnesota attempted 89 field goals and another 35 free throws. The Wolves took early shots, grabbed 14 offensive rebounds and generally played fast in a 108-99 victory. It will be interesting to see if that trend continues in the preseason and throughout the 82-game regular season or if Thibodeau reins things in as time goes on. They seem to have a point guard in Jeff Teague who is more suited to play fast than Ricky Rubio was, but it was just one preseason game. If the Wolves are looking for a model for how you can play fast and still play the strong defense that Thibodeau craves, they will get a close look at it in China during these two upcoming games against Golden State. The Warriors finished fourth in the NBA in pace last season while finishing second in defensive efficiency. That’s a pretty good model to copy.